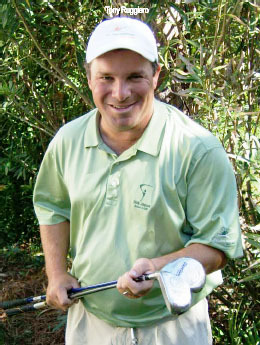 GOLF INSTRUCTION From Fall 2007 Florida Golf Magazine &COPY;Copyright 2007, All Rights Reserved. One of the most asked questions from my students and from listeners of The Dewsweepers golf radio show is: I hit my irons great but I really struggle with my fairway woods and hybrids? Follow the following tips and you will no longer be scared to pull out those fairway woods or hybrids and you will be on your way to scoring better on those longer par fours! Hit your woods and hybrids like you hit your irons. One common thought that golfers have which causes trouble with the fairway woods and hybrids is that they want to hit down on the irons and sweep the long clubs such as their fairway woods and hybrids off the ground. Lets go ahead and scratch that idea and realize that the swing for your longer clubs is exactly like your shorter irons. The length of the shaft and the lie angle of the club flatten out the swing path for you and shallow out the angle of attack. However, the club still swings on a big circle which has a low point. That low point still needs to happen in front of the ball if you want to hit it solid. That hitting down and smashing of the ball into the ground is what gets the ball up into the air. Sweeping the ball or trying to swing up at the ball causes mis-hits and unsolid shots from your fairway woods and hybrids. So lets come up with a few thoughts to take to the golf course and a few drills to help you get the feel for hitting down on your fairway woods and hybrids and improve your longer clubs so you can feel as confident with hybrids as you do with your short irons. On the golf course look in front of the ball. 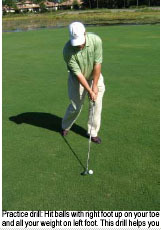 Try to look about a ball-width in front of the ball and focus their rather than at the golf ball. Remember that we are trying to make the low point or the point where the club hits the ground happen in front of the ball. Lets change our focus away from the ball and to focus on where we really want our swing to bottom out. 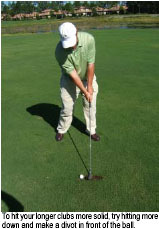 Take practice swings before you hit a shot with the correct divot location. Make sure that you rehearse correctly before each shot. If you take a practice swing and you either miss the ground or make a divot in the back of your stance you did not rehearse the swing you want in order to hit a good shot. Make practice swings focusing on hitting the ground up in the front of your stance. Correct rehearsals will help you develop a correct feel for making good swings on the course. Hit practice shots with your right foot up on its toe and your weight on your left foot. Now make some swings and focus on hitting in front of the ball. This drill is great for getting a feel hitting down on the ball correctly and for finishing off of your right side and onto your left. Try these simple thoughts, and practice, and your fairways woods will feel more solid and you will learn to have the same confidence in your longer clubs that you have in your short irons.